Before you get all worked up, re-read the title. As it is Christmas today, I thought I'd share the best gift I'd ever gotten. You see, in hospital, while getting my treatment (i.e. chemotherapy and radiation), I'd often wake up with intense pain or nausea, often finding myself drenched in sweat. And every time that happened, I got scared. But the worst thing about that was that I'd wake up in the middle of night and not know whether I'd had 5 hours or 5 minutes of sleep... not know whether the doctors or blood collectors would be coming in soon, giving me ample time to sleep, or if they were hours away. I couldn't help but panic when that happened. I used to always complain about this. But one day my uncle overheard me. And he thought up an ingenious solution for this problem. He set out to get me a clock. To this day, I can remember my jaw dropping as he unveiled this masterpiece. And never again did I feel that panic when I'd wake up at night. Instead I'd be left smiling at the most ridiculous gift I'd ever gotten. The clock itself was a godsend. For the first time, I was lifted out of the confusion that is hospital, where I'd be stuck inside 4 walls, left to sit in a constantly chilled 24 degrees Celsius without any knowledge of what was going on in the outside world. I wouldn't worry about whether or not I should bother to get back to sleep. I was, for the first time, in power in hospital. "My Nikhil! What a large CLOCK you have!" Wish you and your families all the best for the next year, and hope this can help put a smile on you or your loved ones' faces. We're close to an AIDS cure, with the help of BMTs. HIV/AIDS is a scary condition. More than 35 million people live with it today. More that many have died at its hands, as of 2012. To this day, 1.5 million people are dying because of it every year, in 2005 that number was 2.2million. And more than that are being infected every year. It affects 1/20 people in sub-Saharan Africa. And right now, there is no cure. There are many myths about this - but there are only 3 routes of the virus actually spreading. 1) Through sexual contact, which is why there is a huge negative stereotype and discrimination of patients with this disease. The chances of this can be significantly reduced through the use of protection, by providing said protection and through education. 2) Through contamination by bodily fluid, which occurs rarely by blood transfusion (a risk as low as 0.00002%, or 1 in 5million, though in less developed countries the screening is less efficient and thus it remains a large way of spreading), needle stick injuries or exposure to infected blood on skin (also a very low chance of it actually infecting you) or through sharing of drug needles. Aggressive treatment 48 - 72 hours after therapy can drastically reduce the chances of infection as well. 3) Mothers can pass it on to their babies, though the chances of this occurring can be drastically reduced if you get access to programs which reduce this vertical transmission. This lowers the chances of getting the disease through this route from the current 25% by 92 - 99%. There ARE treatments now for patients who have HIV/AIDS. Treatments that have made the condition a chronic one in some parts of the developed world. But there is no cure, yet. And the average life expectancy for people from infection with the HIV virus until death is only 9 - 11 years. The HIV virus itself has a few different variants, but they are all retroviruses. AIDS, acquired immune deficiency syndrome, occurs after a few months after HIV infection and causes patients to become less and less able to fight infections. These infections, along with higher chances of developing cancers, are usually the cause of death in HIV/AIDS patients. Antiretroviral therapy can stop the disease from progressing as quickly and prolong life, when these therapies can be accessed. Highly active antiretroviral therapy (HAART) is a combination of these drugs, working through different mechanisms, which together have made HIV/AIDS a chronic condition for millions. This, when combined with treatment of infections and screening for cancers. However, it is estimated that 12 million of the 34million sufferers of HIV/AIDS can't even access these medications, and many of the remaining 22million cannot take them daily, as is needed. Missing doses can confer resistance to this therapy. And ongoing antiretroviral therapy has many serious side effects on the rest of the body, especially the heart, brain and kidneys, and a list of these can be seen here. You may have heard last year of a baby who was "cured" of HIV infection with aggressive treatment with this therapy and there are 14 French patients who doctors reported had a similar low rate of disease in the body when they stopped taking these drugs. These patients still have HIV infected cells in the body though, and it may not remain that way in the long run, but it offers hope where there was none before. This therapy may have been inspired by the original Berlin patient, who was functionally cured (have no side effects and a very small rate of infected cells) of HIV/AIDS for the first time in history in 1998. He was put on antiretroviral drugs as treatment, as well as a cancer drug not usually known to treat HIV/AIDS, but came off it. It is not known why this happened though, and with only 14 other cases of a functional cure after stopping these drugs having been reported in France, it's not considered a curative option as such. The second Berlin Patient however was different. Timothy Ray Brown was diagnosed with HIV/AIDS in 1998. He developed AML (Acute Myeloid Leukemia, what I had) in 2006. 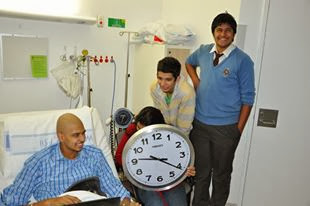 His doctors arranged for him to have a bone marrow transplant to treat the leukemia. There is a mutation present in the genes of an estimated 4 - 16% of the European population on the CCR5 gene (CCR5 is a protein on the surface of white blood cells - blood cells responsible for fighting off infections, but HIV1 often uses this to target and enter immune cells of the body from which point it progresses) which confers higher immunity from being infected with HIV/AIDS, and total immunity if you have the allele (which occurs if you are homologous for the mutation, that is, if both your mother and father passed it on to you). Timothy Brown was lucky enough to have a matched unrelated donor (read more about bone marrow transplants here) and even luckier to have one who had a homologous CCR5 gene mutation. After his marrow was ablated (completely killed off) and the donor's haematopoietic stem cells (cells which make blood) were infused and they engrafted (began to make cells), within months there were no detectable levels of HIV virus in his tissues. And to this day, his CD4 T cell count remains high (HIV infection reduces these counts), despite being off antiretrovial therapy, and only very minute levels by the most sensitive tests can detect any HIV in his tissue. His doctors insist these are actually dead HIV cells. They're probably right, as with that mutation, there's no real way for HIV to enter and infect other host CD4 T cells. Thus, he was the first person to be cured of HIV/AIDS. The others I discussed above are considered in remission, and it is not known whether or not the disease may return for them. Unfortunately, though, the chances of this happening for every HIV/AIDS patient is extremely low, as not only do you have to have a perfect HLA match with another person, they have to also have such that homologous mutation, only present in a maximum of 2% of the European population. And also, bone marrow transplants are often painful, expensive, risky procedures and with HIV/AIDS now considered a chronic condition (though a median survival of 9 - 11 years if you're infected early and not getting proper therapy is pretty low - this number skyrockets to 43 years with proper therapy), it isn't seen as a good option for curing the disease. So How Can This Case Lead To A Cure? Even though the chances of getting such a match is very low, and even though BMTs are a heavy handed curative option, scientists are still using this case to think of cures for other patients. Antiretroviral drugs are very expensive, and currently, about a third of patients who have HIV/AIDS don't even have access to them, yet alone continue to stay on the medication. And drugs which target the interaction between CCR5 and the disease and block it aren't likely to be successful in most patients either (though they can reduce symptoms and delay onset of AIDS), as there are other avenues for the disease to spread. So scientists are looking to using the CCR5 delta 32 mutation, which Brown had in his transplant, to create a curative option. Unfortunately, we aren't advanced enough to consider genetic engineering as a cure yet (though this is changing, it's been done on mice to treat haemophilia: click here : and is being considered in patients, as you'll read later), but we can still use this information to create other avenues of treatment. A trial started soon after Timothy Brown's famous case to allow patients to also be cured of the disease. The basic theory is to remove a patient's own T cells, modify them at the CCR5 gene to create CCR5 proteins with that desired delta 32 mutation, through the use of Zinc Finger Nucleases (proteins which can alter DNA sequences), and reinject these cells into the body to see the response. Phase 1 and phase 2 studies (studies done to test safety and, to an extent, efficacy of treatment strategies) have been done so far with this approach, with promising results. And here's a link showing how current trials are being done. It's very interesting how they're using measures similar to a bone marrow transplant (ie immunosuppression like cyclophosphamide) to kill off old, quickly replicating T cells and allow the genetically modified ones to prevent infection with the HIV virus. There are phase 1 studies to determine whether or not these treatments are safe, where the number, or dosage, of T cells and the side effects of these are assessed. And phase 2 studies are occurring where a zinc finger nuclease is used in conjunction with immunosuppression to allow these T cells to flourish, as opposed to old ones that could still be infected; and finally taking patients off antiretroviral therapy to see the effect of the intervention. Even more excitingly, there are preclinical trials being done to see if this therapy can be done to haematopoietic stem cells (cells that make our blood) to make this a PERMANENT cure, rather than something that needs to be done regularly throughout life (possibly through something akin to an autologous bone marrow tranpslant. The reason why the therapy I talked about above will require constant reinfusion of modified T cells is because HIV can lurk in other types of cells such as macrophages and B cells which have small amounts of CD4 expressed on them too). This is pretty much GENETIC ENGINEERING. And they are expecting to file an investigational new drug application to the FDA sometime next year for this. If this occurs, and can be done for other mutations, this approach could possibly cure a lot of blood cancers too. So What Does A BMT Have To Do With It? Remember, it was a bone marrow transplant which created this interesting new avenue of research into a cure. And because of this, we may be reaching a day where AIDS is something that can be cured. It may even have applications to other diseases, such as cancer, which we currently are struggling to cope with. New curative options can be explored if the haematopoietic stem cell application is accepted by the FDA as a new drug avenue, and may even mean the creation of better treatments for a lot of cancers (especially those of the blood). Even so, the treatment is still likely to be expensive (though not as much as ongoing treatment with antiretrovirals) and it will likely be years before it reaches a stage where it's widely available to the public. The question still remains: Will it be available to the millions living in poverty with this disease, who can't even get access to current therapy? Indeed, studies show that condoms are still the most cost effective way to reduce the spread of disease. To the most amazing people I know, Thanks. One person my father got a lot of strength from when I was diagnosed with cancer was my brother. His reaction to the news that I had a tiny chance of surviving, hinged on a risky procedure which couldn't even guarantee a better outcome, yet alone success, was immediate. And gave him, and me, the hope we needed to carry on. "So what can I do? He can take my marrow if he needs it." Immediately. Without even knowing what that meant for him. Not only was he looking toward the future and reminding my father that a small chance is still just that - a chance - he was willing to do his all to make sure I made it, no matter what the cost. I'm blessed to have such an amazing brother. Now imagine a complete stranger willing to do that for you. Well... I've been blessed with that too. And not only once - but twice. To be fair to my brother, I guess my donors knew what they were getting into. That it wasn't nearly as bad as it sounded. A bone marrow transplant often (in over 90% of cases) doesn't even involve the bone marrow for the donor - the process is not too dissimilar to giving blood actually. And joining the bone marrow donor registry - which is how you can potentially become a donor - is even easier. All they need is a sample of your DNA, in the form of a cheek swab or a blood test. So join a bone marrow donor registry today. In Australia, joining the ABMDR requires a blood donation (which is actually a free health checkup, and can earn you money, click here for more info) and the signing of an extra form.